Purpose: To compare the efficacies of punctal plug insertion and Botulinum toxin injection in dry eye disease not responding to topical medications. Materials and Methods: A non-controlled randomized clinical trial of two parallel groups of 60 dry eye patients seen in the clinic not responding to topical medications were divided into two groups. One group received punctal plugs and the other group received Botulinum toxin injections to prevent lacrimal tear drainage. Results: Of a total of 36 patients with a mean age of 44.5 years who received punctal plugs, 50% of them experienced improvements in the clinical manifestations of their disease. 12/36 (33.3%) developed plug extrusion, and 6/36 (16.7%) patients developed conjunctival erosions with irritation that necessitated plug removal within one week of insertion. A total of 24 patients with a mean age of 47.5 years received injections of Botulinum toxin. Of these, 83.3% had improvement in all of the clinical manifestations of dry eye. 4/24 (16.7%) had no improvement in the degrees to which they experienced foreign body sensations, 33.3% reported shampoo entering the eye while showering. All of the patients who received Botulinum toxin injections were satisfied with the results of their treatment, whereas only 72.3% of the patients who received punctal plugs were satisfied with their results. Conclusion: Botulinum neurotoxin A injections can be a very good alternative to punctal plugs in improving the clinical manifestations of dry eye disease They are associated with the development of fewer and milder complications and with higher levels of patient satisfaction. Botulinum neurotoxin is a neurotoxin that blocks the release of acetylcholine at the neuromuscular junctions of cholinergic nerves; the therapeutic administration of the toxin leads to decrease in muscle contractions. Many non-aesthetic ophthalmic uses of Botulinum toxin have been identified, including focal spasticity,  overactive bladder,  total painful joint arthroplasty  and lacrimal hypersecretion syndrome. Sahlin et al. , were the first researchers to propose and study the effects of Botulinum neurotoxin A (BTA) injections on the lacrimal drainage system to prevent excessive tear drainage. When they injected 2.5-3.75 U of BTA to the medial part of the orbicularis oculi muscle either to the lower lid or to both upper and lower lids, the orbicularis pump mechanism around the canaliculi was found to be reduced with resultant decrease in tear drainage of up to 62% and 70% subjective improvement of dry eye symptoms. The current study is the first clinical trial designed to compare the efficacy of Botulinum toxin injections for dry eye relative to the efficacy of the standard punctal plug insertion, which might lead to use of Botulinum toxin as a viable treatment option for patients with chronic dry eye disease not responding to topical medications. After obtaining approval from the ethics committee at the King Abdulaziz University Hospital, all patients presented to the oculoplastic clinic with a diagnosis of severe dry eye disease from February 2011 till May 2011 and who agreed and signed the consent form to join the study were enrolled. Patients who had any history of lacrimal disease, lacrimal surgery, facial palsy or facial irradiation or who were using any systemic medications that can interfere with tear secretion- or drainage-like chemotherapeutic agents or ocular medication other than artificial tears at the time of the study were excluded. All patients were then tested for preexisting lacrimal drainage system obstruction through dye disappearance test (DDT) by instillation of fluorescein dye in the inferior conjunctival cul-de-sac. Results were considered normal when there was a complete disappearance of the fluorescein dye after five minutes from instillation. Only patients with normal DDT were interviewed, and they were asked the standard ocular surface disease index questionnaire [Table 1]. The severity of dry eye was calculated by multiplying the sum of scores by 25 and dividing it by the number of questions answered. All patients underwent clinical examinations that were specific to the signs and symptoms of dry eye including fluorescein staining of the cornea, tear film break-up time (BUT), and Shirmer's 2 tests. BUT test was considered positive when a break in the pre-corneal tear film appeared in less than 10 minutes after instillation of fluorescein dye, and a positive Shirmer's test is when the amount of the Shirmer strip wetting is less than 5 mm. Severe dry eye disease was diagnosed when the patient scored ≥70% in ≥7 questions of the ocular surface disease index and had two or more positive specific dry eye test results. All the patients with severe dry eye were started on topical artificial tears for one month together with treatment of any ocular surface disease that can cause or aggravate dry eye disease. After which they were re-evaluated and those who showed failure of improvement of their dry eye clinical signs and symptoms stopped all dry eye medications and underwent a non-controlled randomization into two parallel groups matched in age and gender of which one of them received punctal plugs inserted in both lower puncti and the other group received BTA injections in the lower lids. The choice of the method of treatment used was based on the patient preference after explanation of the risks and benefits of both treatment options. Although both treatment methods were provided free of charge, most patients chose punctal plugs as it is the known standard treatment option. Punctal plugs were inserted under slit lamp biomicroscopy using preloaded single-use punctal plugs (FCI Ophthalmics, Inc., Paris, France). Patients who received Botulinum neurotoxin type A (Botox; Allergan Botox, Westport Co, Mayo, Ireland) were given a single subcutaneous injections of 0.1 mL (3.3 U/0.1 ml) of the toxin 2 mm inferior to the lid margin medial to the lower punctum of both lower eyelids. This dose and location of the injection were chosen based on the previous work of Salhin et al. , which showed more complications with the higher dose of 3.75 U and with injection of both upper and lower eyelids. All patients were given appointments for follow-up examination 2 weeks to allow time for the Botulinum toxin effect to peak and to pass the first week of irritation that is experienced by most patients who receive punctal plugs. Follow-up evaluations were then scheduled at 1 month, 3 months and 6 months after treatment. At each follow-up appointment, each patient was re-interviewed [Table 1] and any improvement or worsening of his or her symptoms was recorded. All of the patients underwent repeat clinical evaluations that included recording of any changes in the heights or contours of their eyelids, any new symptoms, fluorescein staining of their corneas, measurement of the tear-film BUT, Shirmer's 2 tests and DDT to confirm a successful blockage of tear clearance by the studied methods. The results of these tests at the follow-up examinations were compared with the pre-treatment test results for each patient and the level of the patient satisfaction was also recorded [Table 2]. Statistical analysis was performed using version 20 of the SPSS software package (SPSS, Inc. Chicago, IL, USA). Pearson Chi-square tests and Fisher's exact test were performed to analyze each variable. A P < 0.05 was considered statistically significant. A total of 60 patients with a diagnosis of severe dry eye disease not responding to topical medications were enrolled in the study. Thirty six patients received punctal plugs. Their mean age was 44.5 years (22-67 years); 20 of them were men. A total of 24 patients received Botulinum neurotoxin type A. Their mean age was 47.5 years (25-70 years); 14 of them were men. [Table 3] shows the demographic data. [Table 4] shows the clinical signs and symptoms of dry eye before and two weeks after treatment in the two treatment groups. Within the punctal plug group of patients, 10/36 (27.8%) patients were satisfied with the treatment, 4/8 (50%) of those with an initial abnormal Shirmer's 2 score showed improvement over their pre-treatment scores. Half of all the patients who received punctal plugs (18/36) developed complications in the form of either plug extrusion (33.3%) or continuous irritation and conjunctival erosion (16.7%) Moreover, all the 6 patients who developed continuous irritation requested removal of the plugs within one week of insertion. All 24 patients who received Botulinum neurotoxin type A injections were satisfied with their treatment. All the 24 patients who received Botulinum neurotoxin type A showed a post-treatment increase in the Shirmer's 2 score regardless of whether the pre-treatment score was abnormal (6/24) or normal (18/24). 8/24 (33.3%) of the patients who received Botulinum neurotoxin type A injections reported getting shampoo in their eyes while showering and 4/24 (16.7%) did not have any improvement in the degrees to which they experienced foreign body sensations and increased tearing prior to treatment, although they showed an improvement in Shirmer test, BUT and corneal fluorescein staining scores. [Table 5] lists the complications occurring in both treatment modalities. 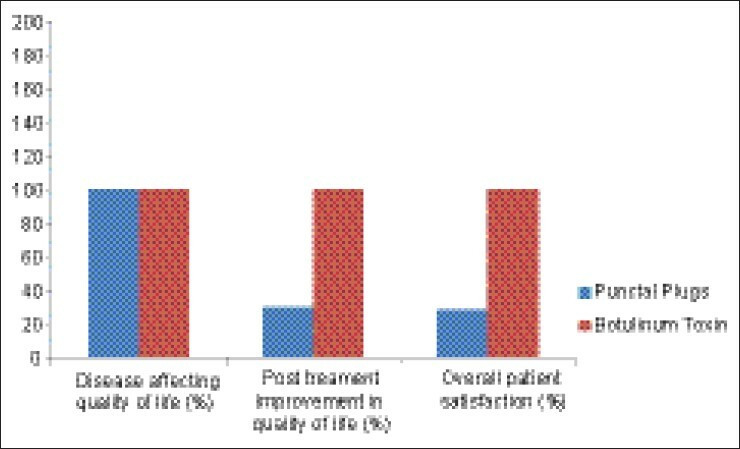 [Figure 1] demonstrates a comparison between the two groups of patients in terms of quality of life and overall satisfaction. Botulinum neurotoxin type A injection effect reversed in all the injected patients over a mean time of 4.5 months, and the pre-treatment manifestations of dry eye in these patients resumed. All the patients expressed their willingness to receive repeated injections for control of their dry eye disease. The results of the present study show that the use of injections of BTA to prevent tear drainage improves the clinical manifestations of severe dry eye disease when topical medications fail. It also shows that BTA can be a better alternative to punctal plugs as it carries fewer complications and better patient satisfaction. All of the patients who received BTA injections were satisfied with their treatment in contrast to this, 50% of the patients who received punctal plug insertion, largely because the degrees to which they experienced improvements in the clinical manifestations of their disease were variable and the development of complications. Sahlin et al. , noticed that although the lacrimal drainage capacity was decreased by 52% when patients were given injections in both upper and lower eyelids and by only 42% with one injection to the lower eyelid, the patients who received two injections were often unsatisfied with their treatment because they developed unsightly retractions of their upper eyelids and some patients experienced tearing and foreign body sensation due to the weakening effect of BTA on the orbicularis oculi muscle. Due to the aforementioned result, we chose to give our patients a single injection in each lower lid, and none of our patients developed lid retraction, but 16.7% had recurrence of their foreign body sensation after an initial improvement for one week (notably, they still had improved Shirmer's scores, BUT and fluorescein corneal staining) together with the development of tearing. This may be due to weakening and disturbance of the blinking power without an obvious clinical evidence of lagophthalmos, but enough to cause foreign body sensation. This theory has to be investigated by further studies using injections of lesser concentration of BTA that disturbs the lacrimal drainage mechanism without weakening of the blinking mechanism. Spira et al. noted the development of an unexplainable increase in tearing among patients with Sjogren's syndrome who received injections of BTA for treatment of blepharospasm. On the other hand, Price et al. and Horwath-Winter et al. did not find any improvement of in the dry eye disease symptoms nor Schirmer test results among their patients who suffered from both dry eye disease and blepharospasm after they received BTA injections for treatment of blepharospasm, but there was an improvement in BUT and Rose Bengal scores. Among our patients, all those who received BTA injections showed an increase in their Schirmer's score even in those with normal pre-treatment levels. They also had an improvement in both BUT scores and corneal fluorescein staining. This may indicate that BTA injections have a stimulatory effect to tear production by the lacrimal gland in patients with Sjogren's disease when the toxin is injected away from the gland as it is known that the toxin can diffuse to the lacrimal gland when injected at the temporal parts of the eyelids causing decrease in tear secretion. This theory has to be investigated on a larger scale studies with clearer identification of Sjogren's and non-Sjogren's disease patients. Although it has been demonstrated by other reports that punctal plugs can improve the quality of vision and BUT in patients with dry eye disease,  their potential for a variety of complications can be a significant source of patient dissatisfaction. Tai et al. studied the efficacy of 312 silicone punctal plugs and they noted 50.7% extrusion rate, 6.9% conjunctival erosions with increased tearing. Patients in our study developed the same variety of complications after punctal plug insertion and the most common complication was plug extrusion, which occurred in 33.3%, and 16.7% of our patients requested removal of the plug because of intolerable conjunctival erosion and tearing. The limitation of this study is the small sample size and the inability to distinguish Sjogren's syndrome patients. Clinical trial with a larger sample size is needed to compare this treatment with different concentrations of BTA in Sjogren's and non-Sjogren's syndrome patients. The use of Botulinum neurotoxin A injections to compromise the lacrimal drainage system is a very effective and satisfactory method of improving the symptoms of dry eye disease. This method has few complications, most of which are mild, and it generally results in a higher level of patient satisfaction than punctal plug insertion. The possibility that injections of BTA may also increase tear production needs to be investigated further. 1. Bjerrum K. Keratoconjunctivitis sicca and primary Sjogren's syndrome in a Danish population aged 30-60 years. Acta Ophthalmol Scand 1997;75:281-6. 2. Bukhari A, Ajlan R, Alsaggaf H. Prevalence of dry eye in the normal population in Jeddah, Saudi Arabia. Orbit 2009;28:392-7. 3. Marube J, Murube E. Treatment of dry eye by blocking the lacrimal canaliculi. Surv Ophthalmol 1996;40:463-80. 4. Toufeeq A, Mohammad-Ali F. Peripheral corneal ulceration as a complication of silicon punctal plug: A case report. Eye 2007;21:1437-8. 5. Boldin I, Klein A, Haller-Schober EM, Horwath-Winter J. Long term follow up of punctal and proximal canalicular stenosis after silicon punctal plug treatment in dry eye patients. Am J Ophthalmol 2008;146:968-72. 6. Mazow ML, McCall T, Prager TC. Lodged intracanalicular plugs as a cause of lacrimal obstruction. Ophthal Plast Reconstr Surg 2007;23:138-42. 7. Kacioglu ZA, Fleming JC. Long term retention rate and complications of silicone punctal plugs in dry eye. Am J Ophthalmol 2008;145:586-7. 8. Horwath-Winter J, Thaci A, Gruber A, Boldin I. Long term retention rate and complications of silicone punctal plugs in dry eye. Am J Ophthalmol 2007;144:441-4. 9. Lee J, Flansgan JC. Complications associated with silicone intracanalicular plugs. Ophthalmol Plast Recontr Surg 2001;17:465-9. 10. Kim B, Osmanovic S, Edward D. Pyogenic granulomas after silicone punctal plugs: A clinical and histopathological study. Am J Ophthalmol 2005;139:678-84. 11. Williams G, Olver J, Graaf S, Singer B. The use of Botulinum toxin type A in the management of adult onset focal spasticity. A survey of Australian allied health professionals. Aust Occup Ther J 2012;59:257-64. 12. Soljanik I. Effecacy and safety of Botulinum toxin A intradetrusor injections in adults with neurogenic detrusor overactivity/neurogenic overactive bladder: A systematic review. Drugs 2013;73:1055-66. 13. Singh J. Efficacy of Long-term Effect and Repeat Intraarticular Botulinum toxin in Patients with Painful Total Joint Arthroplasty: A Retrospective Study. British Journal Of Medicine And Medical Research [serial on the Internet]. (2014, Jan), [cited April 11, 2014]; 4 (1): Available from: MEDLINE. 14. Dutton JJ, Fowler AM. Botulinum toxin in ophthalmology. Surv Ophthalmol 2007;52:13-31. 15. Sahlin S, Chen E, Kaugesaar T, Almqvist H, Kjellberg K, Lennerstrand G. Effect of Botulinum toxin injections on lacrimal drainage. Am J Ophthalm 2000;129:481-6. 16. Sahlin S, Linderoth. Eyelid Botulinum toxin injections for dry eye. Dev Opthalmol 2008;41:187-92. 17. Spira H, Abell PA, Simpson DM. Botulinum toxin increases tearing in patients with Sjogren's syndrome: A preliminary report. J Rheumatol 1997;24:1842-3. 18. Price J, O'Day J. A comparitive study of tear secretion in belpharospasm and hemifacial spasm patients treated with Botulinum toxin. J Clin Neuroopthalmol 1993;13:67-71. 19. Horwath-Winter J, Bergloeff J, Haller-Schober E, Schmut O. Botulinum toxin A treatment in patients suffering from belpharospasm and dry eye. Br J Ophthalmol 2003;87:54-6. 20. Hofmann RJ. Pearls and Pitfalls in Cosmetic Oculoplastic Surgery. Springer: New York, 2008. 21. Kaido M, Ishida R, Dogru M, Tamaoki T, Tsubota K. Efficacy of punctum plug treatment in short break-up time dry eye. Optom Vis Sci 2009;85:758-63. 22. Tai MC, Cosar CB, Cohen EJ, Rapuano CJ, Laibson PR. The clinical efficacy of silocone punctal plug therapy. Cornea 2002;21:135-9.